The damp, icy air quickly filled the coop. I jumped into action, puffing up my chest, pulling my girls close on the roost. I opened my big, strong wings and tucked hens underneath, helpless to protect my delicate comb and wattles from the elements. I stood firm, though, against the weather to protect my flock. I would have given my life, if it had been required. Yes, he is that amazing of a boy! That morning, I gave the veterinarian a quick call and we had two options that would result in the same likely outcome. Frostbite is indicative of tissue death, and Luigi would lose his comb. I could have taken him to the vet to have the comb amputated (called “dubbing”), or care for it at home with the same outcome. I’m a veteran chicken keeper, seasoned in first aid, so I wasn’t afraid of Option #2. I felt that Luigi was in no stress and the frostbite didn’t seem to be cause any pain. He was eating, drinking, scratching for bugs and tending to his ladies. I chose to treat him at home than stress him with a visit to the hospital. 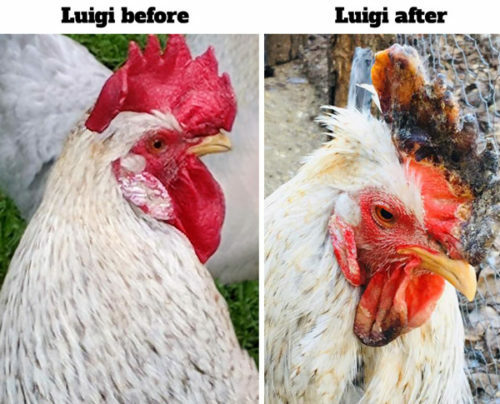 In case a frostbitten comb turns up in your flock, I want to share with you what I did to help Luigi. Protect frostbitten tissue. When the wound spray dried, I slathered on a good coating of Green Goo. Again, I chose this product because it is all-natural and includes some great herbs: Plantain, Yarrow and more Comfrey. I will reapply this every few days. Ward off infection. My go-to is RopaPoultry oregano oil plus suppement. You mix it right into their water. Oregano has strong antibiotic-like magic to help ward off infection, plus RopaPoultry contains other natural astringents like cinnamon. Added extra vitamins to his diet. I like Sav-a-Chick Electrolytes and Vitamins because it is inexpensive and comes in single-use doses. Anytime a bird is stressed, giving them a bit of a boost is important. Over the next few weeks, Luigi’s frostbite will continue to shrink and die off, and eventually, the damaged area will fall off entirely. I was assured this is not as painful as it sounds. He really does seem okay and certainly loves the extra attention he has been getting! While Luigi’s story gives an example of winter drama, there are ways to prepare your flock for routine winter health and to prevent frostbite. Check out this older blog on our site that has great tips. Good luck and stay warm!